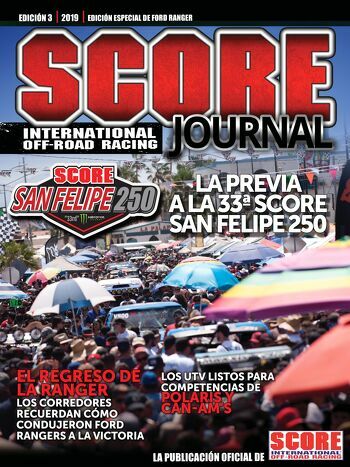 ENSENADA, Baja California, Mexico — With the drawing for starting positions next Thursday (Sept. 14), entries continue to arrive from States all across the USA and countries from around the globe for this month’s Tijuana 21st Annual SCORE Desert Challenge. Racer and media registration for Round 3 of the four-race 2017 SCORE World Desert Championship is available on the SCORE website at www.SCOREInternational.com, where the course map is also available. Race dates and race-week festivities are Sept. 20-24. The race features classes for cars, trucks, UTVs, motorcycles and quads. Early entries to date have come from 12 U.S. States and host nation Mexico along with Austria, Brazil, Canada, Germany, Great Britain, New Zealand and Spain. States with entries so far are Arizona, California, Colorado, Florida, Idaho, Nevada, New Mexico, North Carolina, Tennessee, Texas, Virginia and Wyoming. With no qualifying for any classes in this race, the drawing for starting positions within each class will be held on Thursday, Sept. 14. To be included in the start draw, online racer registration will close at 11 p.m. on Wednesday, Sept. 13. Online registration will continue after the drawing until 5 p.m. on Sunday, Sept. 17 with late registration at the host hotel on Wednesday and Thursday (Sept. 20 and 21). Among the early entries in this race are five entries from the powerful RPM Racing team. Based in Bristol, Tenn., RPM has three entries in the marquee SCORE Trophy Truck division, one in the new SCORE TT Legend for drivers over 50 years old and one in the unlimited Class 1. RPM SCORE Trophy Trucks entries are Carlos ‘Apdaly’ Lopez, Tecate, Mexico, team co-owner Justin Matney, Bristol, Tenn. and World Rally Championship veteran Armin Schwarz , who is from Germany and lives in Austria. Clyde Stacy, RPM co-owner from Bristol, Va., will be racing in the new SCORE TT Legend class, and Derek Fletcher, Abingdon, Va., will be racing in the unlimited Class 1 for open-wheel desert race cars to complete the five-vehicle RPM team for this race. Among the other entries to date in the featured SCORE Trophy Truck division for high-tech, 850-horsepower unlimited production trucks are Billy Wilson, Corpus Christi, Texas, Mark Post/Ed Herbst, Las Vegas. This race has one father and daughter and one mother and son all entered in separate classes. Gary Magness, Denver, is racing in SCORE Trophy Truck and his daughter Chelsea Magness, also of Denver, is racing in Trophy Truck Spec. Shelby Reid, Apple Valley, Calif. is competing in the unlimited Class 1 and her son Cody Reid, also of Apple Valley, is driving in Class 10. Both racing in the unlimited Class 1 but in separate Jimco race cars for Wilson Motorsports will be SoCal cousins Brad Wilson and Brian Wilson, both from the Long Beach, Calif. area . Among the entries in the motorcycle classes and riding on separate Honda motorcycles will be Ox Motorsports teammate Mark Samuels, Yucca Valley, Calif. and Ray Dal Soglio, Scottsdale, Ariz. in the Pro Moto Unlimited class. International Rally racer Santiago Creel of Mexico City has entered three motorcycle classes on three different KTM bikes. Creel, 31, is the rider of record in Pro Moto Unlimited, Pro Moto Limited and Pro Moto 30. The unique-format race will be held at a spectator-friendly start/finish line and ‘hot pit’ area located on the southeast outskirts of Tijuana to the east of the popular Rancho Casian area off of Boulevard 2000 (Highway No. 201). The actual start/finish line area and hot pits will be located 2.3 miles inland off of the highway. The official race course of 23.4 miles will see all classes cover a total of six laps for 140.4 total miles split into two parts. Moving to the largest city on the Baja California peninsula will be the special split-format, multi-lap Tijuana 21st SCORE Desert Challenge, marking the first time in its storied history that a SCORE race has started and finished in Tijuana. With just three months remaining before the historic 50th anniversary race of the iconic SCORE Baja 1000, the City of Tijuana and the Tijuana tourism groups has given SCORE a multi-year contract that moves the race from nearby Rosarito Beach where it was held last year. Running predominately on land owned by prominent developer Grupo Musquis, SCORE Race Director Jose Grijalva confirms that this year’s course is extremely beautiful and picturesque with more places to pass than last year’s course. He further stated that around four miles was actually part of last year’s course that started and finished just south of Rosarito Beach. The course runs in a counterclockwise direction with two checkpoints. Checkpoint 1 will be at race mile 12.05 and Checkpoint 2 will be at race mile 17.8. Pre-running exclusively for all car, truck and UTV vehicles will be held on Friday (Sept. 15) and Saturday (Sept. 16) and pre-running exclusively for motorcycle and quad vehicles will be held on Sunday (Sept. 17). Contingency will be held in directly in front of the headquarters hotel on the historic Avenida Paseo de los Heroes from 9 a.m. to 5 p.m. on Thursday (Sept. 21) with tech inspection lasting one hour longer until 6 p.m. The event features three full days of racing. SCORE Race Director Jose Grijalva has put together a 23.4-mile loop course through the challenging hills in the area that each class will run a total of six laps over for 140.4 total miles for the race. Running in a counter-clockwise direction, motorcycles, quads and one group of car classes will race in split heats on Friday (Sept. 22) starting at 6:30 a.m. Racing will finish on Friday at 6:20 p.m. The other car and truck classes, including the marquee SCORE Trophy Truck, SCORE TT Legend the unlimited Class 1 and Trophy Truck Spec divisions will run the first half of their race on Saturday (Sept. 23) and final half on Sunday (Sept. 24). Racing for those classes will start each day at 8 a.m. and finish at 4:25 p.m.
During the Friday (Sept. 22) racing action, two of SCORE’s historical VW Baja Bug racing classes (Class 5-1600 and Class 11) will hold the Art Savedra Memorial Shootout in memory of SCORE’s Tech Director who passed away recently. These classes will run both halves of their race on that day with a time-out between their sessions. There will be a special trophy and bonus purse for this special part of the race. Unique for SCORE, the 21st the SCORE Desert Challenge will use this race format that has all classes racing in five different groups for a total of six laps over a surprisingly rugged 23.4-mile race course (140.4 total miles) split into two, three-lap sessions. Tijuana is one of the five largest and fastest-growing metropolitan areas in all of Mexico. The city has also experienced tremendous growth in recent years, attracting investments by electronics, aerospace and medical tourism firms and is also regarded as one of the top cuisine destinations in the world, including craft beer production. Tijuana has also recorded its best hotel occupancy rate in the last 15 years and has attracted additional hotel chains like City Express, Holiday Inn and the Hyatt Hotels among others. Only two races in SCORE history have started in Tijuana. The first was the inaugural SCORE Baja 1000 (then called Mexican 1000) in 1967 and then again in 1995. In both of those years the SCORE Baja 1000 finished in La Paz. The four-race 2017 SCORE World Desert Championship in Baja California, Mexico along with the SEMA SCORE Baja 1000 Experience/SCORE Baja 1000 Qualifying in Las Vegas will all air on El Rey Network in the United States. International distribution is by way of syndication. The season-ending 50th SCORE Baja 1000 will have a two-hour show produced while the other race shows are and Las Vegas qualifying are each one-hour telecasts.